The seeds of a great ‘work winning’ NEXT quarter are sown in THIS quarter. More specifically, what you do to fill your pipeline, nurture relationships, source new referral partners, build strategic alliances, set up conversations in the next 30 DAYS will dictate what your business looks like in the next 90 days. What are you doing NOW to make next QUARTER start well? Will you hit your targets or make your quotas? Not if you dawdle and delay for the next few months. You’ll be scratching around looking for your next deal, lead or opportunity. Be action-oriented. What 2-3 things are YOU doing in the next 90 days to fill your pipeline, serve your clients and win new business? Make a plan with 2-3 areas of focus, and stick to it. Keep things moving. Don’t let things stall or coast. Keep the reachouts, the networking, the connecting, the conversations and the BD (business development) activity going these next few months. Play to your strengths. No need to copy anyone else. You can win work and raise your profile your own way. Your personality, your goals, your markets, your targets, your style. There are many ways to successfully win work. Find your optimum. The more people you know and the more people know you, the more business you’ll create. It’s a simple as that. 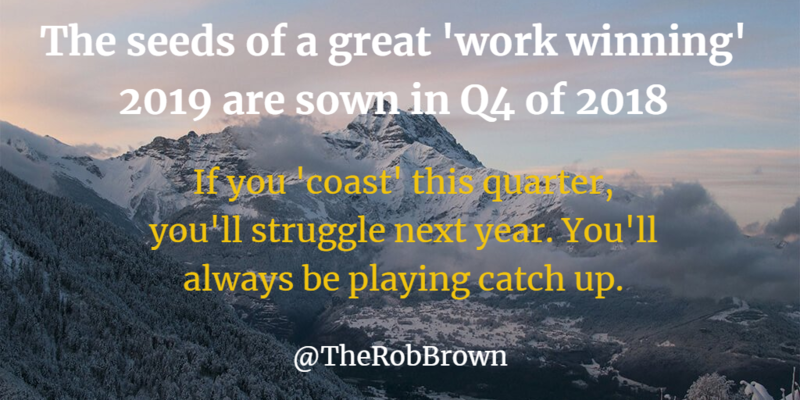 If you ‘coast’ this quarter you’ll struggle next year. You’ll always be playing catch up.